ARDGLASS Development Association has announced a ‘Green Tech’ jobs initiative for the Ardglass and Ballyhornan areas featuring a coalition of local farming interests, community groups and Green Tech companies. They aim to turn the Lecale area into a centre of excellence for the storage of renewable energy both on the all-Island grid, and as a base to develop new green-tech products for export. A number of project plans will be drawn up over the next few months. The Programme is based on the idea that the key to solving these energy problems is to create a community level microgrid that can manage power flows at the local level. All-Island grid regulations describe such opportunities as Demand Side Units (DSU’s). 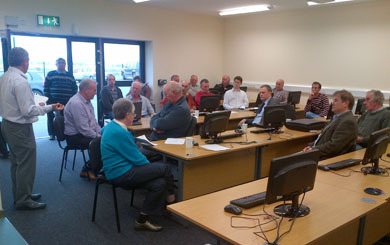 Members of ADA and local farmers pictured at a recent meeting in the Ballyhornan Family Centre computer suite. 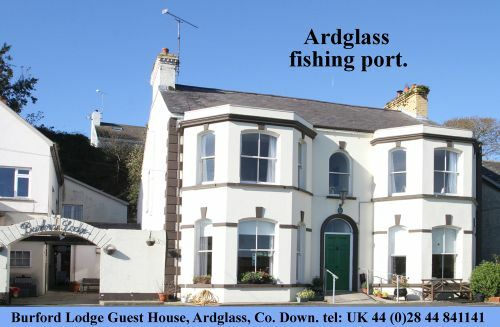 Ardglass, a rural coastal village, is the centre of a rural area to the south-east of Downpatrick which has been chosen by various stakeholders as a suitable location for Northern Ireland’s ‘centre of excellence’ for ‘Energy Storage’. It is envisaged that a series of projects will be proposed, including an ‘intelligent micro-grid’ demonstration project sponsored by a variety of economic and social partners in the Ardglass and Ballyhornan areas. Ardglass Development Association (ADA) is sponsoring the ‘Community Based Intelligent Energy Programme’ which will bring forward a number of projects with ‘Green Tech’ partners over the next few months. ADA are backed by Down District Farmers For Renewable Energy (DDFFRE). This is an UFU-backed group of farmers in Lecale wanting to develop their businesses into energy production. A number local businesses and renewable energy companies have committed to demonstrating how new technologies in renewable energy can be made to work on a remote location on the all-Island grid network without the expense involved in having to reinforce the existing infrastructure. Alan Montgomery, chairperson of the local Ulster Farmers Union-backed DDFFRE group said: “The farming community welcomes this opportunity to launch a coalition of local community development interests, ‘Green-Tech’ companies, local environmentalists and ourselves. “We have heard a lot of talk in recent years about the need to become more competitive by making business ‘green’. This programme of work could put Lecale on the map as a centre for excellence in the renewable energy arena”. Local environmentalist and Down District Councillor Cadogan Enright who is chairing the Community Based Intelligent Energy Programme indicated that the programme would be beneficial to every aspect of the local economy in the Ardglass and Ballyhornan areas. He said: “The various projects we are looking at include the primary level with farming opportunities, secondary level with manufacturing opportunities and at tertiary level with a range of possible services especially in the area of software related to energy systems management. This fits with the classic green agenda of ‘think global, act local’”. * The periodic nature of renewable energy can sometimes create surplus when energy is not required by the grid, which unless managed correctly can cause curtailment of supply and lost revenue. This is likely to be an issue with the new off-shore windfarm. Additionally a number of renewable energy companies are associated with the programme of projects, providing technical expertise. Their interest centres around the possibility of creating commercial ways of storing renewable energy, thereby allowing the current target of 40% of energy in Northern Ireland to be increased to 80% as in Germany, or even allow Stormont to aspire to energy self-sufficency as in Scotand. The Bishopscourt airfield in Ballyhornan has been identified as the potential location for the ‘Centre of Excellence’ for the all-Island grid, and has attracted the interst of Invest NI to this project. The Ballyhornan Residents’ Association recently hosted a workshop of Energy Companies, Farmers, Researchers and Invest NI at their Family Centre. Councillor Enright said: “It is envisaged that the Lecale DSU would be based in Bishopscourt to demonstrate how a community-based 33kv rural station can be reconfigured into an ‘energy island’ supplying energy to Urban Areas. “A DSU is a mechanism contained within the all-Island Single Electricity market regulations to allow third party participants to take on the responsibility of balancing electrical load and demand on the lower voltage (11kv) distribution networks. Several of these circuits radiate from the 33/11kv substation located at the Bishopsgate airfield which would be ideal for this purpose. The objective of the Community Based Intelligent Energy Programme is to create products and services that could be demonstrated at the community level that would be exportable across Europe. If such a scheme was proven successful in Northern Ireland, it could allow rural areas to become largely independent by managing and storing while selling energy when it was required to the grid for more urban areas. Cllr Enwright explained that this green initiative could be replicated across the North and the Republic of Ireland through the all-island energy market and regulatory structures. Further, the project will be likely to involve large wind (2 x 2.5MW), small wind (several 250kW), large solar (5.1MW ), small solar (20kW roof and 50kW ground mounted) demand side management for 300 houses (Ballyhornan), AD (2 x 500kWe), ICAES (Isothermal Compressed Air Energy Storage), battery storage, EV charging and ammonia production for fertiliser (ammonia is a renewable fuel which could be made through electrolysis at low cost using ‘otherwise curtailed wind power’ combined with a ‘fee earning load-on-demand service’). He continued: “This model has the potential to be replicated to about 70 additional rural 33kV substations in NI and is equally applicable in the Republic of Ireland (part of SEM). Similar problems exist throughout the rest of the UK and it is expected that business models and opportunities will be developed that can be exported to these regions. “Northern Ireland has the opportunity to develop a leadership position and exploit first mover advantage to become an early adopter’commercial Reference Site for scalable solutions for international markets and to secure a share of the potential export revenue. This will allow exploitation of existing regional strengths whilst building a sustainable platform for the future development of next generation technologies and related intellectual assets and skills. In Feb 2013, the Invest NI sponsored MATRIX Sustainable Energy Horizon Panel Report was issued which ‘identified a compelling opportunity for Northern Ireland to take a leadership role in the development of distributed energy solutions and their integration into Intelligent Energy Systems through establishing itself as an International Reference Site to demonstrate the commercial scalability of these solutions to the global market, which is estimated to be worth £8 billion in 2018’. “At the same time it recognised that there are a significant number of farming businesses that offer the potential to act as nuclei for rural community-based projects. The Lecale DSU project will represent the first of these projects. Through this project the partners will seek to develop the blueprint for the construction of future community based Intelligent Energy Systems and develop the knowledge and skills to deliver market leading product and service offerings. “The Ulster Farmers Union has conducted research that indicates that as many as 1000 single wind turbines within N.Ireland may become stranded due to prohibitive grid connection costs. This represents up to £500m of investment into the local economy that cannot take place, representing lost revenues of £100m per annum. Development of this project will explore potential solutions to this problem and open up commercial pathways to allow this investment to proceed,” added Cllr Enwright.